The Hirohata Mercury was restyled inside and out, many elements on this car, including the fully detailed trunk, started new trends in customizing. ver the years I came across more and more photos taken at early 1950’s car shows that show custom cars with their hoods and trunk open. 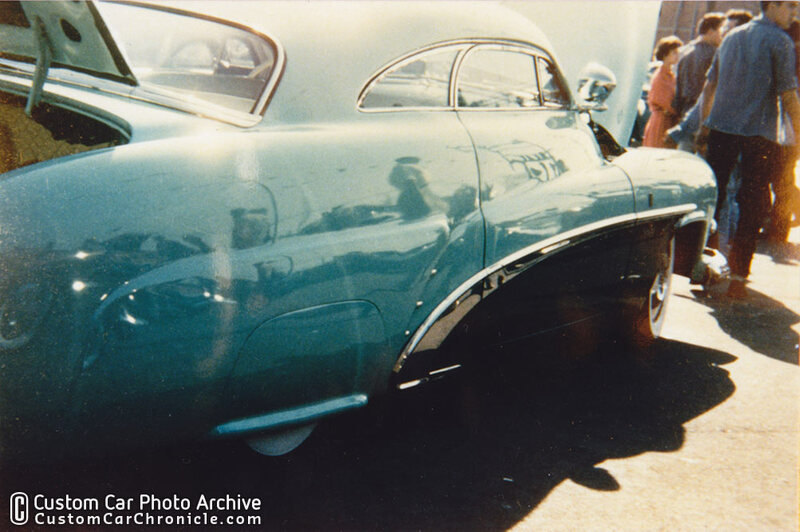 Especially photos taken at outdoor shows in the early 1950’s show custom cars with the open door, hood and trunks. 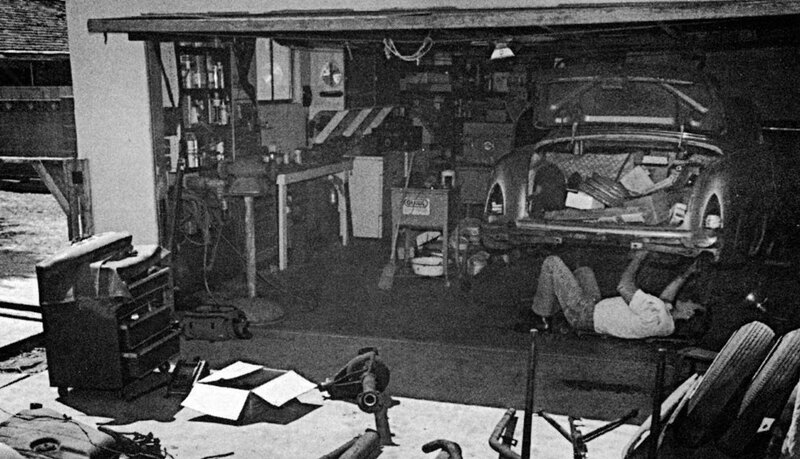 Later in the 1950’s and early 1960’s making points at cars shows was really important and the more details you showed to the judges and public the more points you got. So in those later years, everything was opened to show all the details and gain points for more trophies, even wheels were removed to show undercarriage details. It appears that in the early 1950’s shows the owners would show the cars both closed and opened from time to time at a show. This allowed he public to see both all the details inside as well as the wonderful shapes of the outside of the cars. Custom Cars in the 1940’s usually had mostly stock engines, some had some speed parts, but mostly that was done for more power, and not so much for the looks. 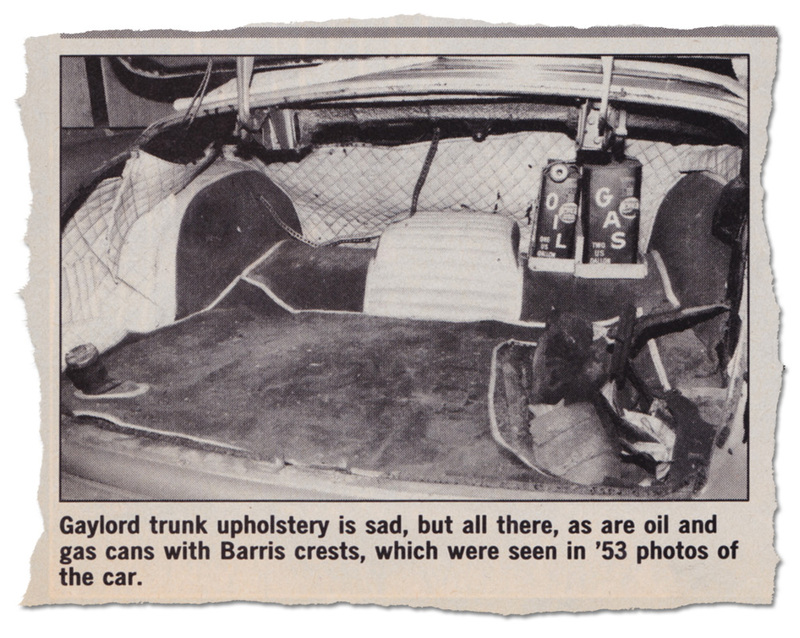 The trunks were sometimes upholstered, but not really to be shown, just to be practical. Later in the early 1950’s things changed. And more time was spend to detail more and more sections of the cars. In the early 1950’s some, and actually quite a few cars had chromed and detailed engines, and the owners loved to show their car with the hood open. Even more cars with fully upholstered high-end interiors liked to show of the cars with the doors open, and showed cards if the upholstery shop to advertise their work (perhaps for a discount on their own upholstery). 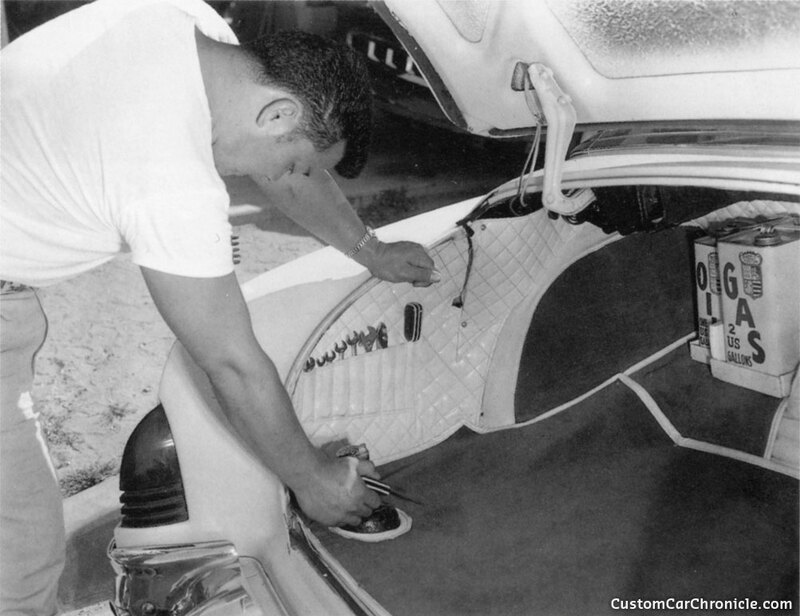 If you had a really detailed car with a fully upholstered trunk you also wanted to show off that work and opened the trunk at the shows. 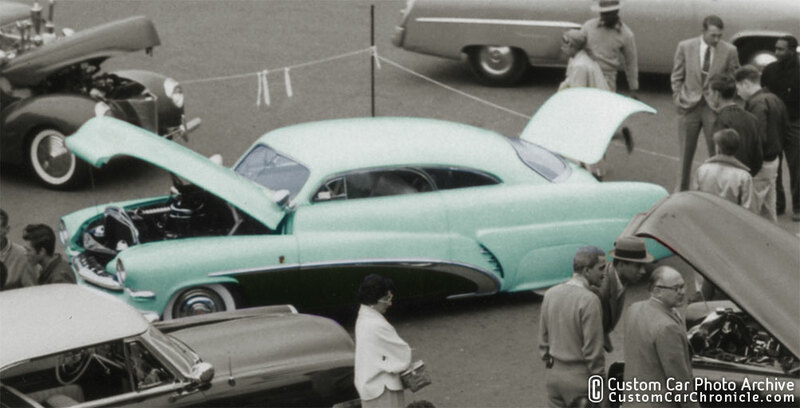 One of the first photos of the Hirohata Merc I noticed with the trunk open was this one taken at the Custom Car and Hot Rods show held at the Thrifty’s drug store parking lot in Los Angeles May 15, 1954. One of the Icon Custom Cars from the early 1950’s that can be seen at shows with the trunk open was Bob Hirohata’s 1951 Mercury by Barris. 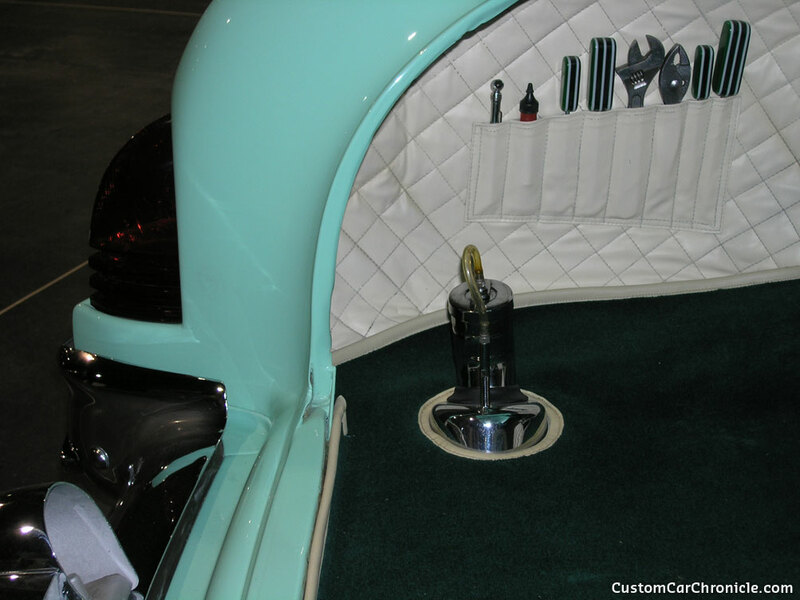 Bob had a fully detailed trunk (as well as chromed engine) and loved to show-off all the detail work that went into his car. Cars like the Hirohata Mercury with so many details added to the interior, engine and trunks kind of started the later award points craziness. But before the mid 1950’s everything was still “normal” and the awards at the car shows still went to the best looking custom cars, and not to the one that had the most modifications, or the most chrome plated parts. 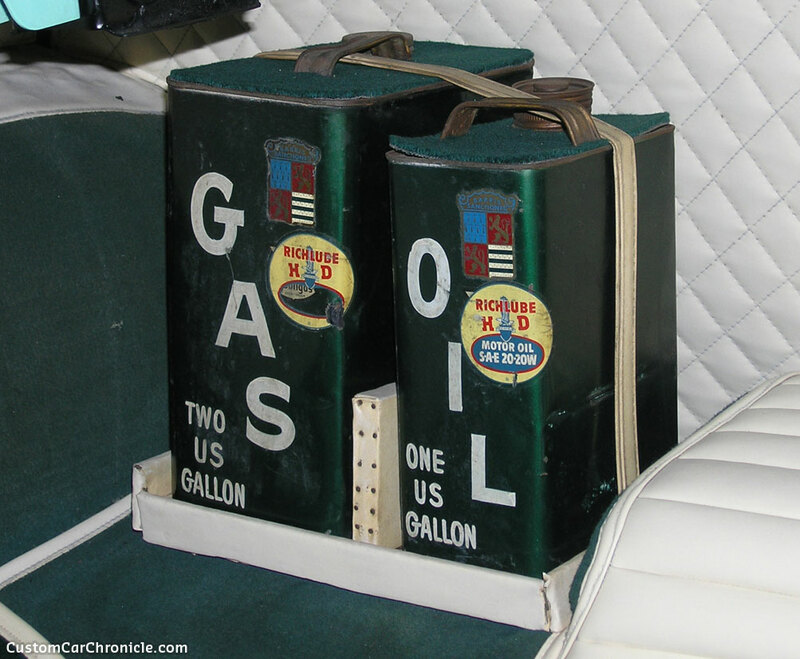 Lets take a look at what Bob had to show in the well detailed trunk of the Hirohata Mercury. 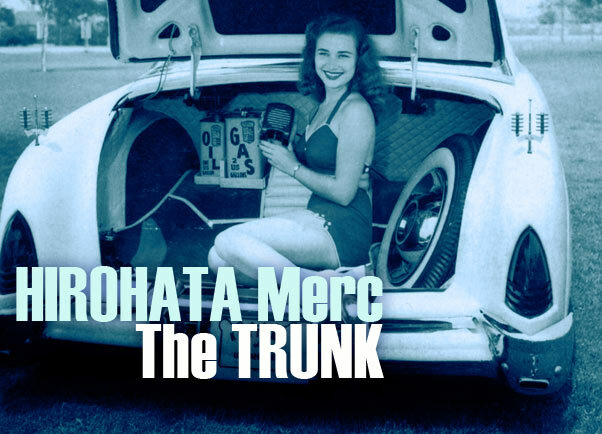 This photo of the Hirohata Merc trunk appeared in the November ’53 issue of Honk Magazine. 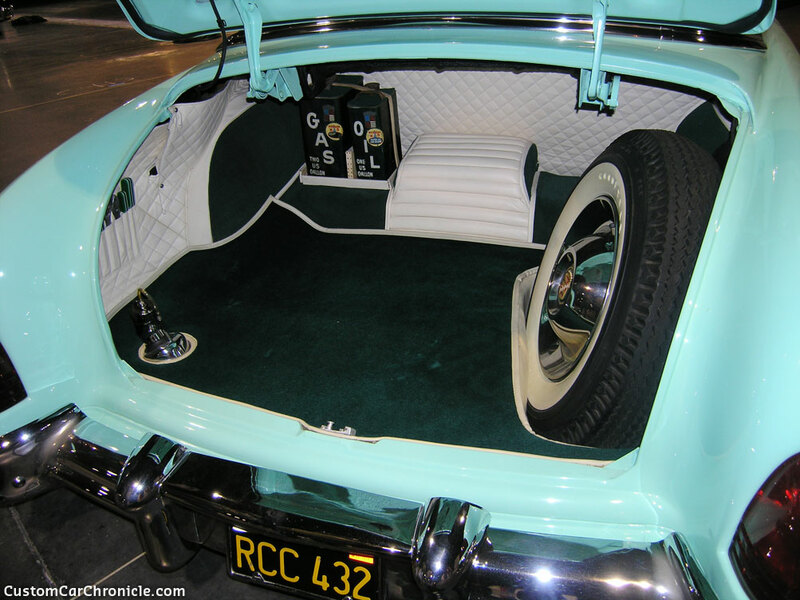 It showed a fully detailed and upholstered trunk. Matching spare tire with Cadillac Sombrero mounted. 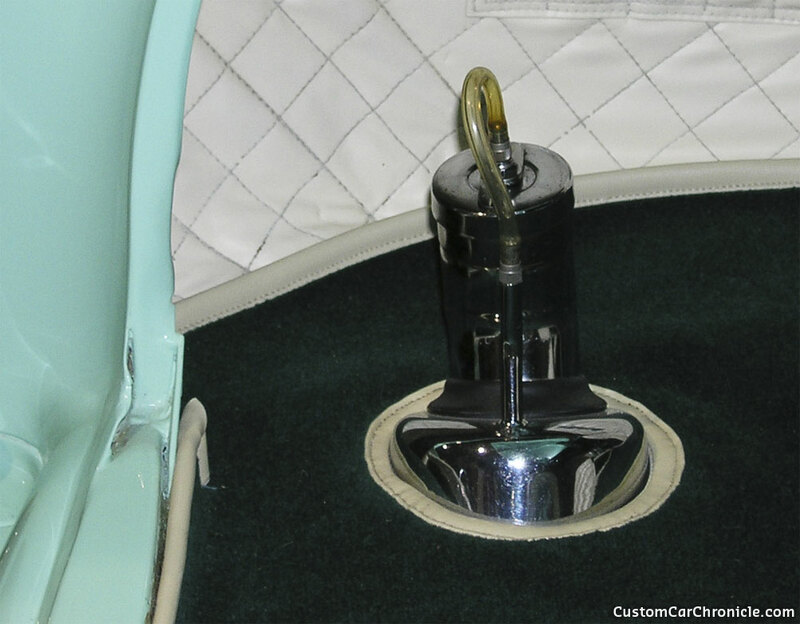 The gas filler was relocated in the trunk, but detailed and the carpet was neatly finished around the base of it. I took this photo of the completely restored Hirohata Mercury at the 2009 Sacramento Autorama Mercury Gathering. Jim McNiel did an amazing job restoring the trunk to early 1950’s specs. 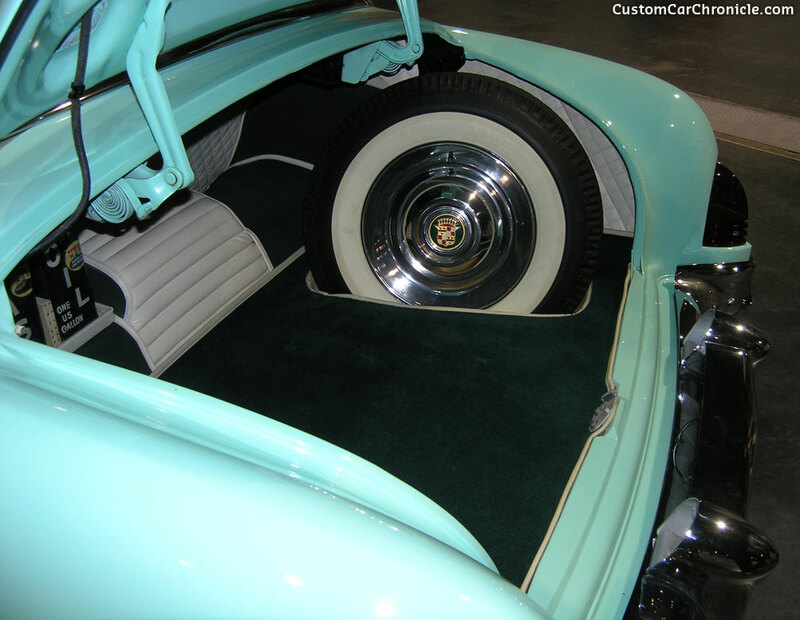 Eddie Martinez was responsible for recreating the Bill Gaylord upholstered trunk. 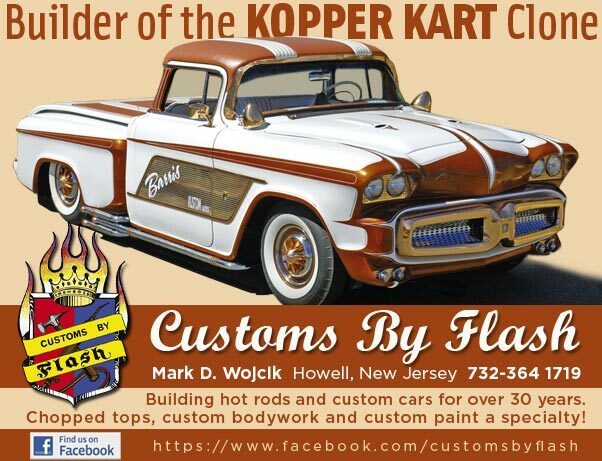 Bob Hirohata on his famous Kross Kountry in a Kustom trip to the Indianapolis 500 and Custom Car show in 1953. Bob is filling the Merc with gas and it looks like Bob and his co driver did store some stuff in the trunk, but it was filled all the way. Possibly more stuff for the long trip was stored on the passenger seat to try and get the weight distributed as much forward as possible. Famous model in the trunk photo taken by George Barris. 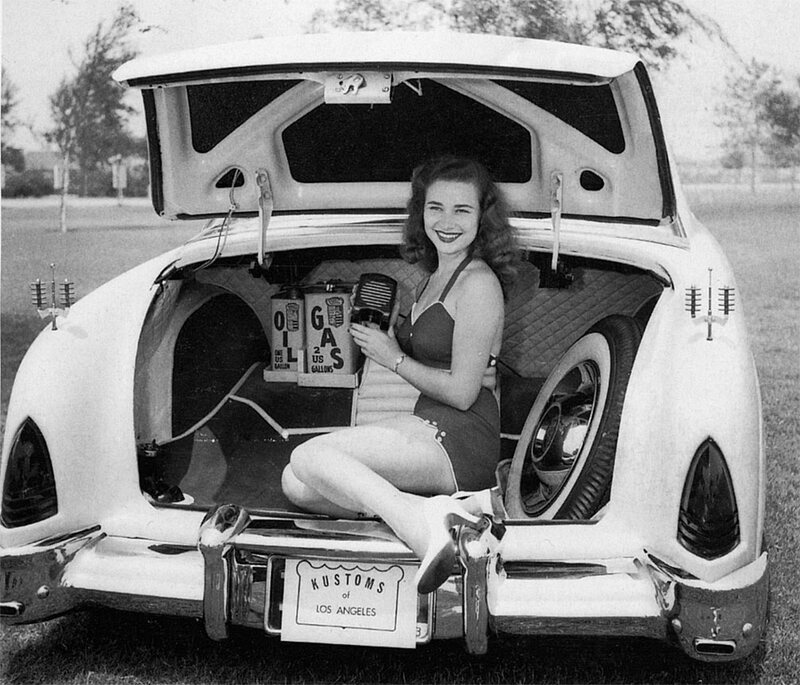 It appears the model is holding an drive-in speaker that can also be seen sitting on the upholstered section in the 1953 Honk Magazine photo. Bob Hirohata wrote a letter in 1956 to Rodding and Re-styling magazine about the car. In his letter he explains that the speakers in his trunk have 50 foot long wires, for picnics (thank you Frank for this info). This photo also shows the Space-Age Antennas Bob Hirohata added to the car. Only very few photos show these. 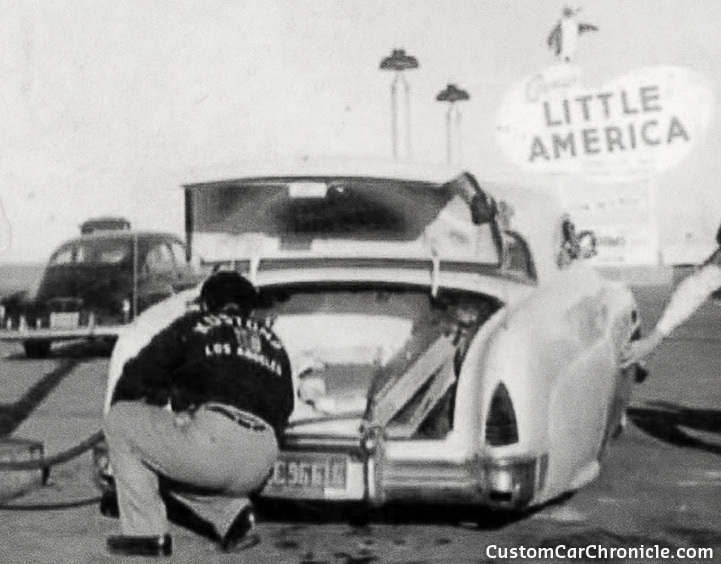 There is one other photo taken at the same location showing that the car is using 1953 Cadillac hubcaps now. The spare tire in the trunk still has the early Sombrero mounted. And the Oil and Gas cans are painted in the sea-foam body color. Taken at an unknown outdoor show, shows the Hirohata Mercury in color again with the hood and trunk open. 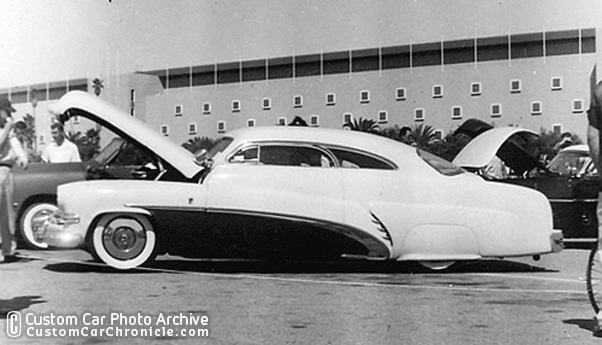 Another photo of the Hirohata Mercury taken at an outdoor show at the Hollywood park race track in Inglewood showing the car with open hood and trunk. The car has 1953 Cadillac hubcaps now. 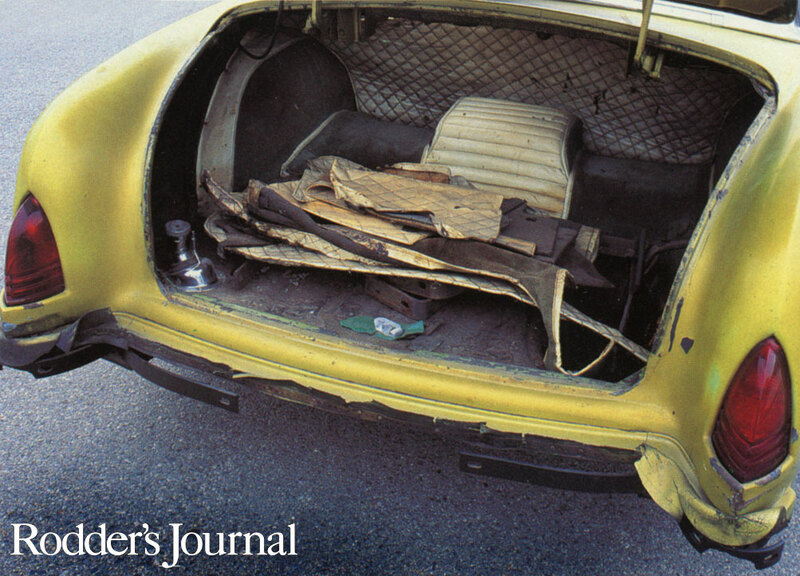 Photo from the Rodder’s Journal shows the trunk pre-restoration. The photo shows it had a hard live and was not always taken car of as it should have. But most of the upholstery is still there and could be perfectly replicated by Eddie Martinez. Another looks at the restored trunk with wonderful period looking word by Eddie Martinez who has been doing this kind of work since the 1950’s. These photos also show the one thing that was not molded on the body because the Barris crew ran out of time to get the car finished for the Motorama show… the rear splash pan. Bob Hirohata Checking the fule filler that was relocated in the trunk. He is holding one of the special tools he created with the green and white laminated plastic handle. If you look hard you can see a small portion of the space age antenna next to Bob’s shoulder. 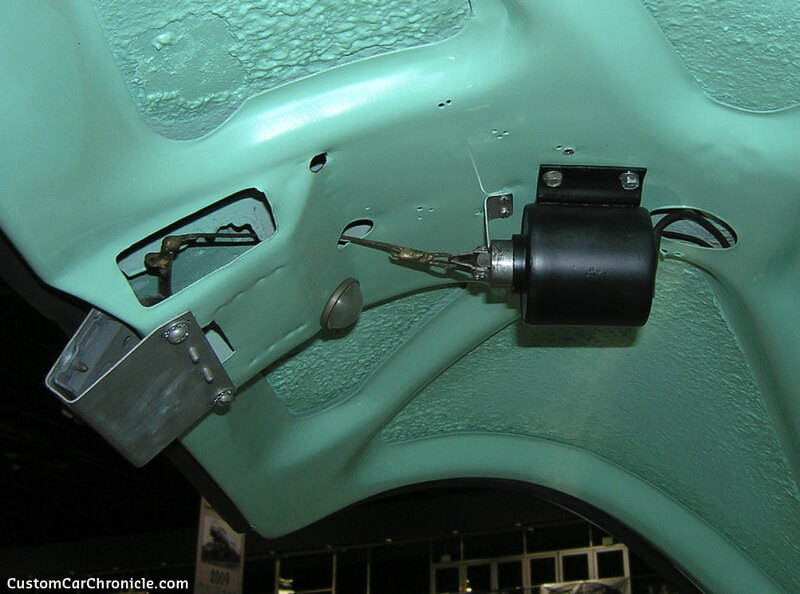 The drivers side had a set of tools and the relocated fuel filler. 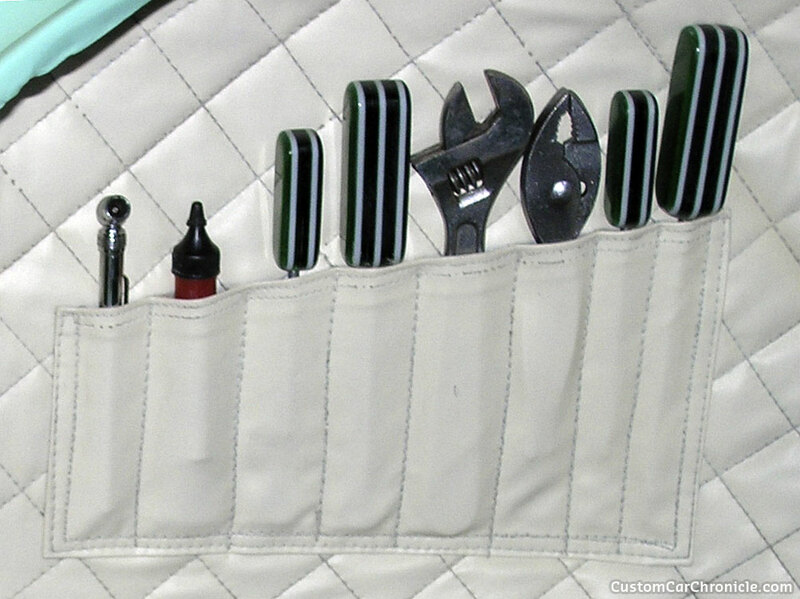 Close up of the special tools with Bob Hirohata made laminated handles. Close up of the gas filler. Nicely detailed and chrome plated. The carpet was neatly finished with white piping. Also notice the simple rounded bottom edge of the trunk opening. A typical way to round corners in the 1950’s. 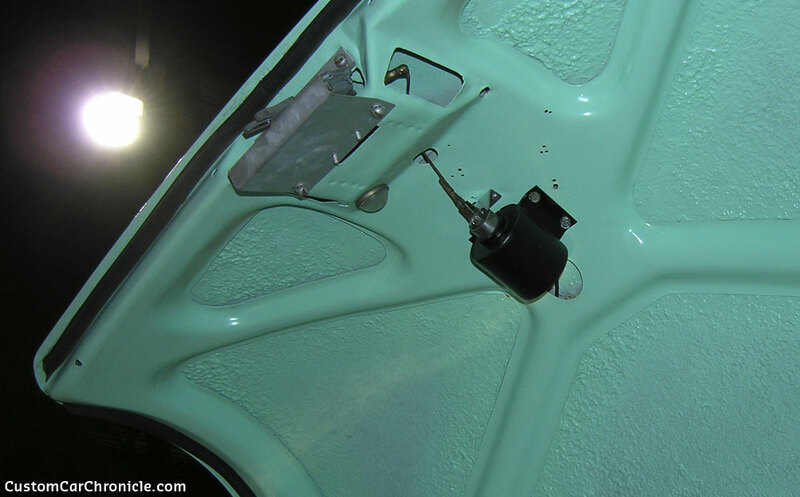 The trunk handle and emblem was shaved and the lock modified to open electronically. 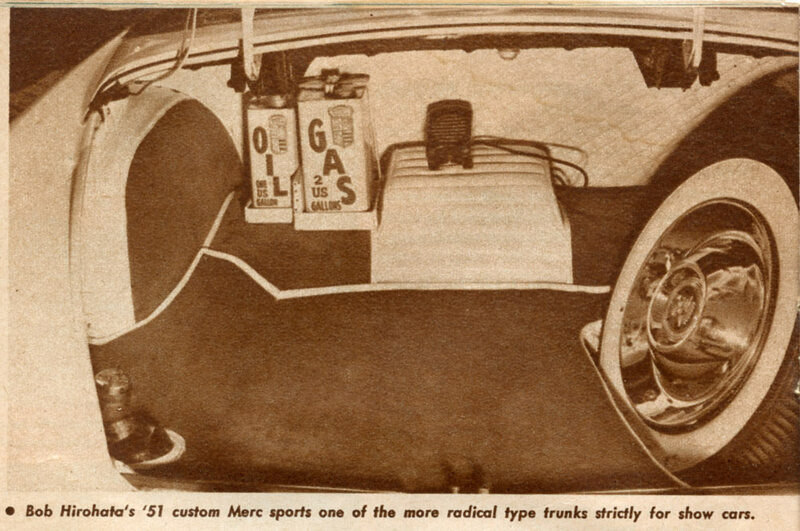 This photo also shows that the whole underneath of the trunk is now painted body color It appears in the 1950’s photos that the inlay sections are either painted a dark color or have been upholstered with dark material. A close up of the remote controlled opener. The hand made bracket and not used holes are all left the way it was done back in the 1950’s. The top photo shows the restored cans, with the original paint on it. It is not sure when these were painted, but most likely after 1955 when the car was repainted as well. 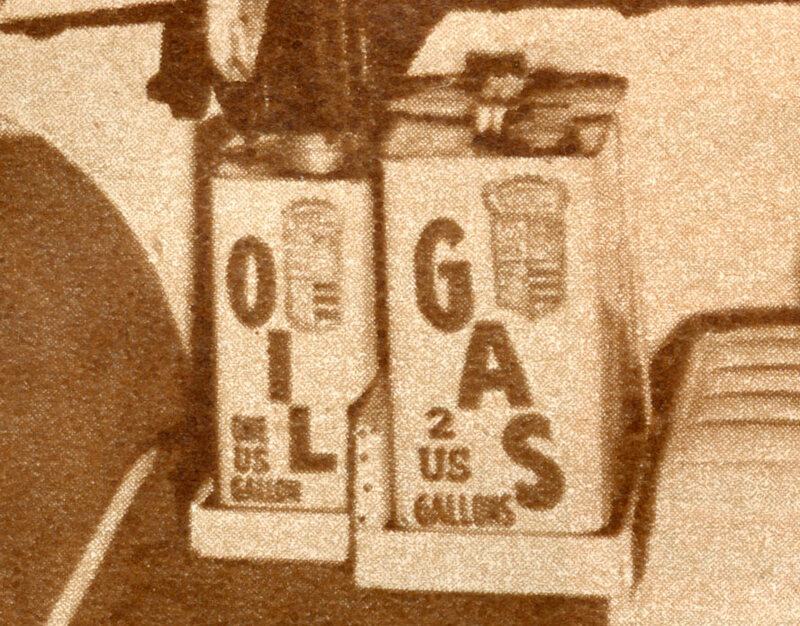 The cans are now dark green with white lettering, while in the 1953 photo (below) they are most likely sea foam green (the lighter body color of the original version). with dark letters. The early version also look to have hand painted Barris Crests, while the later version have Barris Crest decals. Interesting is the carpet used on the top, as well as the base, which seams to have been reversed in the restoration. Both the cans and the base are the original items. 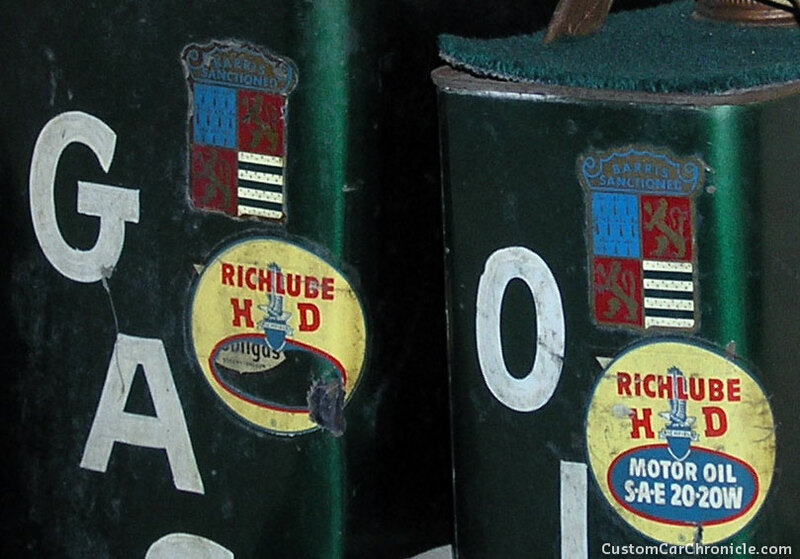 Close up show the Barris crest decals and hand painted letters in white on the dark green painted cans. The model is holding a drive in speaker. It looks like it has a bit of a cord attached back to the radio. Ihave a very similar pair of speakers that came from a Brisbane drive in that sadly closed 15 years ago. Cool article, Rik! I love any type of then vs. now comparison. 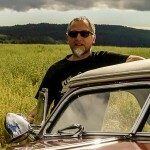 Rik, Hirohata wrote a letter in 1956 to Rodding and Re-styling magazine about the car. In his letter he explains that the speakers in his trunk are on 50 foot wires for picnics. Thank you Frank. I will add that info to the article.